Fig. 18-17. 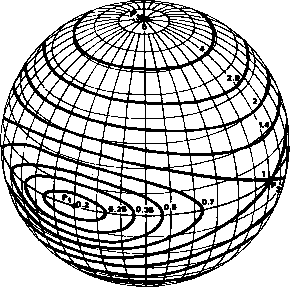 Control System lime Constants, as a Function of Latitude (Spacecraft is Traveling North). See text for explanation. 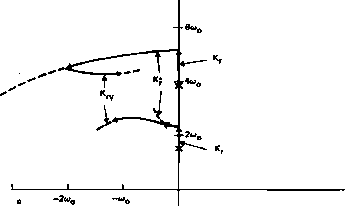 Consequently, the HCMM control system deactivates precession control (i.e., sets kp = 0) whenever \BJ Bx\> 1.4. This "magnetic blanking" results in active control only within about 35 deg of the equator. Detailed parametric studies can thus be conducted to establish near-optimal gains and control laws and to obtain regions of stability by solving algebraic equations without the need for time-consuming simulation. The commanded roll reaction wheel torque, hx, based on position and rate errors, provides a roll restoring torque, together with damping. The wheel-speed-dependent terms in Eq. (18-93) cancel like terms in Euler's equation and effectively remove the roll and yaw dependence upon the reaction wheel speeds (although, of course, the gyroscopic pitch momentum wheel coupling remains). The yaw wheel is torqued 180-deg out of phase with the roll error signal to provide yaw damping. where Kx = 4to„2(/- /,) + hua = 0.011 N • m, K, = hua = 0.026 N • m, H = h - I,a0 = 21.3 N m s, and /,= /,= 7 = 25100 kg m2. Fig. 18-18. Root LocusPlot For SEASAT Control System. See text for explanation.